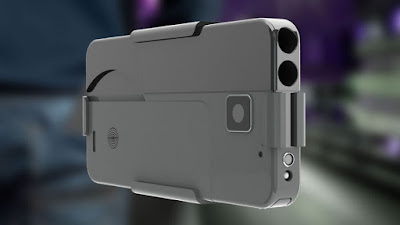 Jared Unzipped: Ideal Conceal Smartphone Pistol Makes Accidental Child Death Easier. Ideal Conceal Smartphone Pistol Makes Accidental Child Death Easier. Coming later in 2016 is the Ideal Conceal .380-caliber pistol. It is shaped like a standard smartphone, as to make concealment all the more easy. With a simple twist, the handle slides down revealing the trigger of the camouflaged gun. The pistol can fire two shots with a hammerless internal mechanism. When collapsed, the Ideal Conceal looks like any other smartphone device, belt clip and all. Honestly, this gun scares the utter crap out of me. Let me be more specific. It's not the gun itself that frightens me. It's the forthcoming accidental shootings with the Ideal Conceal involving children that frightens me. The Ideal Conceal website is emphatic about taking proper care and safety with a firearm -- they explicitly state that guns should be secured for the safety of children. I can't blame Ideal Conceal; they've done their due diligence. Yet, there are parents out there that recklessly leave their firearms (including the forthcoming Ideal Conceal) within the range of a child. How long before we hear a report of a young child digging through their mom's purse to play with her phone, only to find the Ideal Conceal and accidentally kill themselves? What about a young child grabbing daddy's phone off the nightstand, only to accidentally shoot their sibling in the face? You and I both know this can AND WILL happen. In this day and age, I can't support the notion of making guns more invisible. As a tool with the power to give life or death, firearms are not a weapon to be cloaked in secrecy. I'd like to know who has a gun around me, much less around children. Sure, it would not be comfortable when a crowd stares at you for carrying a legal firearm. Is that not the price we pay for freedom, though? If you want to carry a firearm, you have to be comfortable with the strange glances that some uneducated citizens may take. The Ideal Conceal will sell like hot cakes, but I'm counting down the days until the first kid has an accident with it. Don't say I didn't warn you.